For years, Nicholas Negroponte, chairman emeritus of the Massachusetts Institute of Technology’s Media Lab, punted the idea of a US$100 laptop. His idea was that a low-cost machine, ruggedised for conditions in the developing world, would transform education in poorer countries by putting computing and information in the hands of millions of children for the first time. The project, which has morphed over the years into the XO-1, never took off to the extent Negroponte had hoped. And the price of the $100 laptop has remained stubbornly above that level. But the cost of notebook computers — and especially the low-cost netbook category of notebooks — has continued to plummet. Now, SA entrepreneurs Mark Levy and Neil Watson have developed a netbook they hope is going to put computing — and the Internet — in the hands of people who couldn’t previously afford it. They’ve partnered with Vodacom to provide their machine, called the Linkbook, for R199/month. That price, which requires a 24-month contract, includes 300MB/month of data from Vodacom. Levy says the Linkbook, which is already on sale through Vodacom outlets, is garnering significant interest from consumers. But is the Linkbook any good? TechCentral has spent the past two days using the machine and our initial thoughts are fairly mixed. To keep costs down, the machine doesn’t come with Windows preinstalled. Instead, it runs a highly customised version of the K Desktop Environment running on top of the Ubuntu Linux desktop. The Linkbook designers call it Link OS. Link OS’s design is minimalistic, meant to take full advantage of the relatively small 8,9-inch TFT display. Each corner of the display features an icon, which provides access to a range of applications and services. Click on any of the four icons, and the applications available to users — presented in the form of a “ribbon” of icons in the middle of the screen — changes. The four icons bring up applications related to OpenOffice.org (the free Microsoft Office alternative); entertainment (music and movie players); Internet (Web browser, e-mail and the like); and computer settings. There’s a task tray at the bottom of the screen, which includes information about your 3G or Wi-Fi connection, as well as open applications. At the top of the screen is an information bar, which includes the time, a volume controller, battery indicator and a power-down button. Other than OpenOffice, software that comes preinstalled includes the XMMS media player (we’d really have preferred VLC), Pidgin for instant messaging, Sylpheed for e-mail (Thunderbird would have been better) and a Web browser based on Firefox. There is also a bunch of educational games, which is a nice touch. The machine has no hard drive; instead it uses 16GB of flash memory. That doesn’t sound like much, but it’s fine if all you’re going to use the machine for is to browse the Web, check your e-mail, play the games it comes with and produce the occasional document. 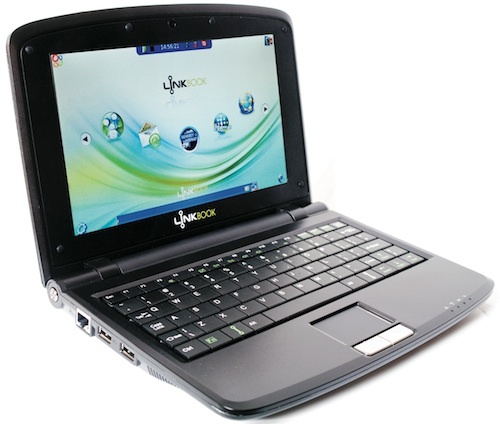 The Linkbook is powered by a Motorola PowerPC processor that seems up to the task of running the applications that ship with the device. It also has 256MB of RAM. Be warned that Flash won’t run on the PowerPC processor, so you won’t be able to watch videos on YouTube or view any other Flash-based websites. Skype also won’t run. There are two USB ports, an Ethernet port, a VGA adapter for hooking the machine up to an external monitor or projector, SD/MMC card slot, and headphone and microphone jacks. Sound through the built-in speaker is tinny but doesn’t distort at high volume. The keyboard is a little cramped — it’s not a full-size Qwerty — and touch-typists could find it difficult to use. But then the machine is aimed mainly at first-time computer buyers, who’ll tend to be two-finger typists. Another problem we found was that the trackpad was a little unresponsive. You really have to press it fairly hard before you can get the mouse pointer to move. The Wi-Fi antenna, located on the right-hand side of the screen, runs a little hot, too, though the base of the machine remains cool. Your lap will thank you for that. As far the software goes, the developers have done a good job of simplifying the Linux experience and making the Linkbook relatively trivial to use. There are some niggles, though. There are a few spelling and grammatical errors in some of the dialogue boxes, for example. What does “You need to determine that you have insert the SIM card” mean exactly? And the update software doesn’t work — it throws up a cryptic message that an average user will simply not fathom. On the plus side, connecting to Vodacom’s network was a snap — we had no problems, though the Link 3G software used to dial up is a little rudimentary. However, if you want to do more than the most basic Web browsing and e-mail on the Linkbook, you’re going to need some experience in Linux. Unfortunately, getting into the guts of the operating system is not easy — there’s no obvious way to get to a text-based command line. We’re told it is possible, though. Also, the version of Ubuntu used on Linkbook looks fairly old — as far as we can tell, it’s running Hardy Heron, which was released more than two years ago. If you’re not going to be able to run the update software — and we couldn’t — then you may be vulnerable to security flaws in the software. Lastly, the battery life is dreadful. A fully juiced battery will last only about two hours with Wi-Fi and 3G switched off; with wireless on, the machine will give you about 90 minutes before it has to be reconnected to the grid. That’s pretty poor compared to other, modern netbooks. Even on AmigaOS 4.X running on PowerPC G3 and G4 machines, and AMCC PowerPC machines, we amigans see with ease Youtube FLV movies thru mPlayer and FFMPEG. And perhaps on Amiga we have also a good Youtube manager AREXX Script Language Program called Tubexx that loads and plays youtube flv files again thru mPlayer, and also Tubexx can be used as standalone, connecting toi Youtube site without opening anty browser. As long as mPlayer on Amiga has been ported from Linux world, I can’t believe that there is not existing also an Ubuntu PowerPC version of mPlayer. Are you sure of your statements mr Mc Leod? Sure Skype doesn’t not run on LinkBook PowerPC based, as Skype is a proprietary software and actually manufactured only for X86 devices, but seeing Youtube FLV movies is a trivial matter for any platform, ARM, PPC or X86. I found the 3g connection dreadfull, if the signal strength is not at least 3/? the internet connection doesn’t come up, the modem sensitivity seems to be much less than even the basic 3g capable phone.